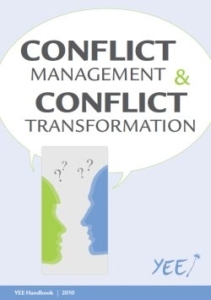 This handbook was produced as a follow up of a training course of Conflict Management and Conflict Resolution, which took place in April 2010 in the Czech Republic. The aim of the project was to raise the potential of youth workers and give them tools to deal with various coflict situations in their everyday life and work. In the handbook you can find information about mapping ourselves in conflict, analysing and dynamics of conflict, how we behave in conflicts, communication, culture and intercultural learning, practice of conflict transformation etc. We hope the publication wil be useful not only for the participants of the training course, but also for other people involved in youth work and wide public.